Comments from Jed: As Jed visits various conventions around the U.S. and the world, he's often asked, 'Which of your designs is your favorite?' That's a hard question to answer, since he does his best on every piece he creates. But if you were to press him, he would admit that 'The Dragon's Gift' is in his top three. 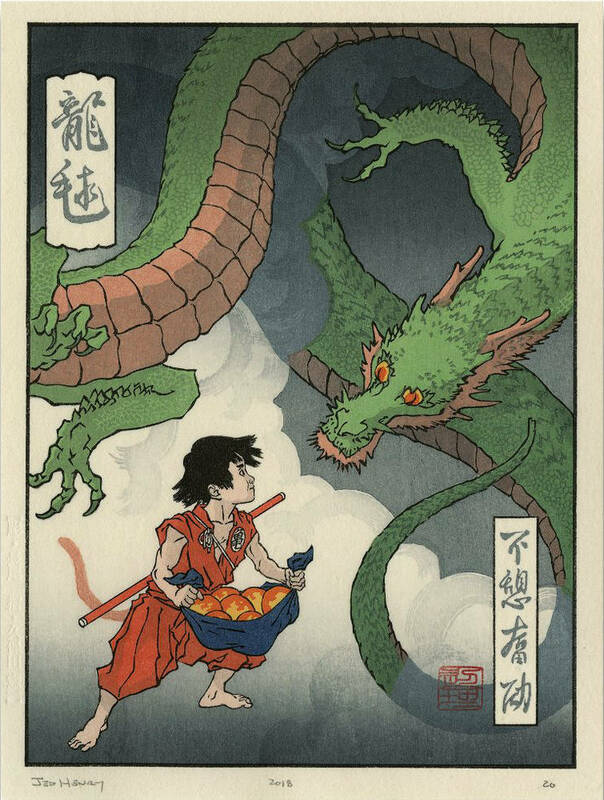 The original Dragon Ball manga created an entire world full of fantasy, wonder and heart. Jed tried hard to capture that feeling of childhood wonder in this piece, and he's pretty satisfied with the result! From a technical standpoint, Dave and his team are doing some of their best work on this print! Look at how seamlessly the dragon passes into shadowy cloud - how delicately his scales are carved and printed! We're so excited to present this wood print to the world!